One of the so-called ‘Big 5’ Racing were formed as a merger of two struggling sides – Football Club Barracas Al Sud and Colorados Unidos Del Sud in 1903. They quickly established themselves as one of the powerhouses of Argentinian football, winning a record 7 consecutive championships during the amateur era. Since then they have gone on to win 16 league titles and the Copa Libertadores in 1967 beating Nacional in the final, making them the first Argentinian side to do so. Following this cup victory, Racing defeated Celtic to win the InterContinental Cup. 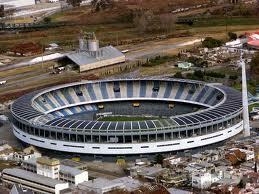 Racing have the third biggest stadium in Argentina, the wonderful Estadio Presidente Perón” or more commonly “El Cilindro de Avellaneda”. It’s ridiculous proximity to Independiente’s stadium in the neighbourhood of Avellaneda makes for a fierce local derby. Despite the size and stature of the club, Racing have won only one championship in close to 50 years.